Dylan Rodwick (right) and Kristen Mullen (directly to his left) are just part of the musical’s talented ensemble cast. When Thornton Wilder wrote — or more accurately, rewrote his 1955 play The Matchmaker — he elevated what had been a secondary character into the leading role. That character was Dolly Gallagher Levi, who proved such a hit with audiences that hers became the title role when the play became a musical in 1964. The Coeur d’Alene Summer Theater turns 45 this year, and how is it celebrating its sapphire jubilee? “We’re trying to go big,” says Jonna Olscamp, the theater’s development director. And how big is big? Uh, Monty Python big. Johnny Cash big. Dennis Franz big. In addition to Hello Dolly! here is the rest of the Summer Theater’s schedule. Less a full-fledged play than what Olscamp calls a “jukebox review.” This is essentially a musical survey of the music of Johnny Cash and, through it, a summary of the legendary singer’s life. Local heavyweights Dennis Franz, Patty Duke, Ellen Travolta and Jack Bannon — alongside regional theater stars Dane Stokinger and Jessica Skerritt — star in a staged reading of a comedy about a young Italian-American man’s plan to move to Seattle from Brooklyn and his grandparents’ schemes to keep him in Noo Yawk. One night only. Olscamp says she expects this one to sell out, so all you Franz fans buy your tickets today! The season’s “boutique musical” uses the intertwined stories of a black musician, the matriarch of a white upper-class family and a Jewish immigrant to tell a story about America itself in the early 20th century. 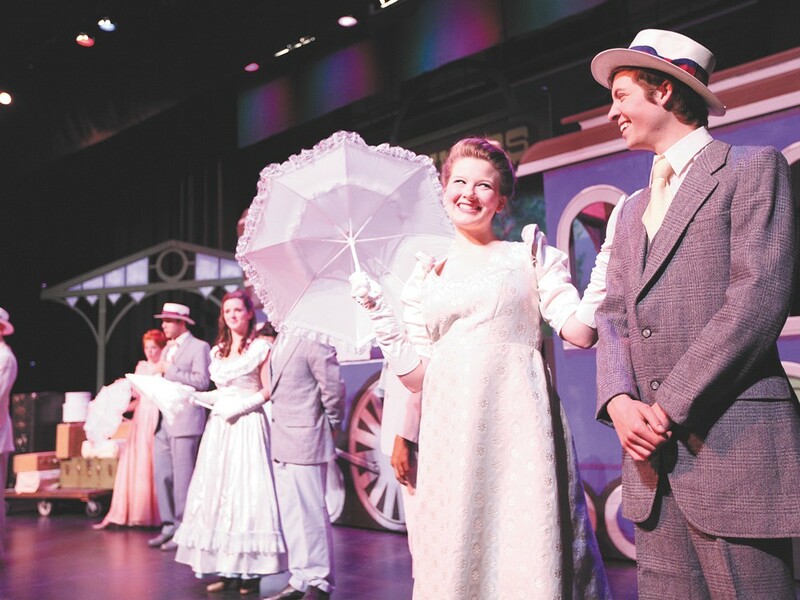 “It’s a sweeping epic,” Olscamp says, “It touches ragtime music and immigration and the American dream. Like so much of the classic musical canon, there’s not much flesh on the bones of Hello, Dolly!, and the turn-of-the-century plot must have seem amusingly quaint even five decades ago. That plot being: widowed Dolly (Ellen Travolta) has a knack for making couples out of individuals. But Dolly’s grown tired of being alone and penniless. With the tacit approval of her late husband, she slyly sets out to pair herself with Horace Vandergelder (Jack Bannon, Travolta’s real-life husband), the famous “half-a-millionaire” from nearby Yonkers, NY, who she’s supposed to be fixing up with milliner Irene Molloy (Krista Kubicek). What redeeming quality Dolly sees in Vandergelder — besides his money, I mean — is never clear. He’s surly, tyrannical, and chauvinistic; his signature tune “It Takes a Woman” practically delights in all the housework his new wife will be expected to do. Meanwhile, Vandergelder’s clerks, Cornelius (Andrew Ware Lewis) and Barnaby (Jeremy Adams), sneak off to enjoy the day in New York City. That’s where they first meet and fall for Irene and her assistant Minnie (Calley McKinney Cabe). With Dolly’s help and a bit of good fortune, they avoid being spotted by Vandergelder and pose as rich playboys to win the hearts of the two women. Despite all his sternness and protests to the contrary, not to mention some hasty transformational scenes, Vandergelder ultimately forgives his delinquent assistants and decides he’s sweet on Dolly. How could things end otherwise? Travolta is clearly the celebrity draw for this production, even though her opening-night performance was beset by uncertain pauses in her delivery. Nor is her vocal range particularly stellar. Yet she makes for a likable and vivacious Dolly with an echt New York accent. She returned for the second act in a decidedly more carefree mood, reveling in the spotlight of the title tune and conspicuously savoring her stage dinner with a slice of ham. For his part, Bannon is fine. His vocal range is even narrower than Travolta’s, but he manages a passable sprechgesang. His change of heart comes a little too suddenly, but that lack of anticipation has more to do with the frivolity of Hello, Dolly! in general. The real show-stealers were the second-billed, Kubicek and Lewis. Not only did they portray credible, sympathetic characters, their voices were also first-rate: Kubicek’s “Ribbons Down My Back” was moving and melancholic, a beautiful and welcome contrast to the musical’s sugary coating; and “It Only Takes a Moment,” her second-act duet with Lewis, was compellingly heartfelt. The orchestra, under conductor Steven Dahlke, deserves special mention, too. Their relatively small ensemble managed a big, Broadway sound, and they hit the sweet spot between music and vocals that has proven so elusive at the Civic. With its unusually infectious show tunes, hometown celebrity cast, and some surprise performances along the way, Hello, Dolly! delivers in almost every way a musical should. Its shortcomings are more easily traced back to the preposterousness of its source material than any aspect of this convivial production.